Learn how Pics.io handles metadata that belongs to your digital assets. While working with digital assets, it is not only the asset itself that you often need, but also the additional information it contains, such as file size, camera settings, shooting conditions, authorship, video codecs, etc. This kind of information is commonly referred to as metadata. In fact, the availability of metadata is what actually distinguishes a mere file from a meaningful asset. One of the biggest advantages of using Pics.io DAM service is the fact that you can not only see all the metadata your asset contains, but also alter certain values and preserve them within the file. How does Pics.io capture the metadata available within the file? There are several standards that regulate the metadata that can be included within a digital file. The most widely-recognized standards are EXIF, IPTC/IIM, and XMP. Whenever a digital file is uploaded to Pics.io, all the available metadata is captured and saved in the corresponding fields. However, the names of the fields may differ across the standards and software producers. That is why, in order to avoid confusion, Pics.io applies certain rules to how the metadata is parsed, shown on the interface, and preserved in case of changes and alterations. Starting from July 2018, we have been using a new schema of importing and exporting metadata. It is available for new users who have got registered in Pics.io since that time. First, the system looks at what it’s written in the corresponding field in XMP. The latter is the most recent and advanced of all standards, so if there is some information about the asset in this group, it is likely to be correct. If XMP is empty, the system moves on to IPTC. And if IPTC is empty as well, the system relies on what’s available in EXIF. This default sequence works with cases when all the fields are the same across all the standards (e.g. CreateDate). * data from the fields Description/Caption-Abstract/ImageDescription appears in the Description section of the Infopanel. ** data from the fields Subject/Keywords appears in the Keywords section of the Infopanel. *** data from the fields Title/ObjectName appears in the Title section of the Infopanel. 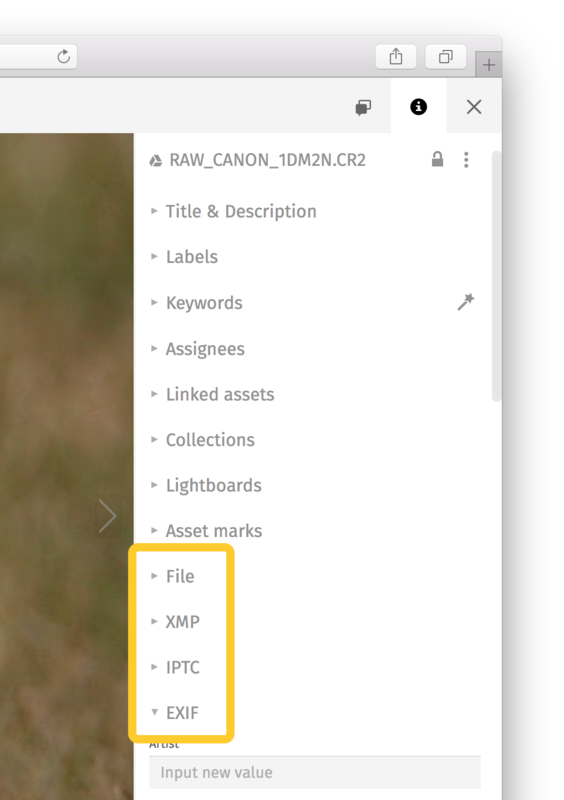 First, Pics.io looks at what’s written in the field Creator in XMP. If there’s nothing there, we look at what’s available in the field By-line in IPTC. If there’s nothing there either, we capture what’s written in the field Artist in IPTC. Once the relevant information is found, it is copied in all the three fields. In this way we achieve more coherence and clarity when dealing with different standards. How can I be sure that Pics.io captured all the metadata that was inside my digital asset? It usually takes a few minutes for the system to transfer all the information from your digital asset to Pics.io database, unless the system is under high load. Though, it is still possible to use the Cyrillic alphabet for these fields right in your Pics.io account and easily search for them. Please note that if you fill these meta fields with the Cyrillic alphabet outside Pics.io and then upload these files to your Pics.io account, we will not be able to replicate them. So it is recommended to use the Latin alphabet for the meta fields mentioned above. Where can I see all the metadata belonging to my digital asset? Once you select a digital asset in Pics.io, you can see all the information about this file in the Infopanel on the right. All the available metadata is captured from your digital asset and stored in the corresponding fields, according to the rules describes above. Some fields may remain empty because apparently there was no available information inside the asset. You can fill in these fields manually with the information you find necessary. All the fields are divided into 5 categories. Please note this is the default schema of metadata fields. If it’s not convenient enough for you, you can always change the arrangement of these fields. Learn more about custom fields settings here. How does Pics.io save changes that I make in the metadata? A big advantage of Pics.io is that all the changes you make in the metadata fields in Pics.io are automatically pushed to your Google Drive. This information is saved within your asset and remains available after you download it and work with it outside Pics.io, e.g. in Lightroom or in a similar service. Pics.io saves the metadata much in the same way as it captured it from the asset, as it was described above. In case of default fields (which are the same for all the standards) the modified info is saved everywhere, i.e. in all the fields that have the same name. For example, if a user changes something in the field CreateDate, this change is saved in all the fields with this name across all the standards, be it XMP, IPTC, or EXIF. But if the fields are called differently in different standards (as in the case with "Creator", the specific rules will apply. Pics.io will find the corresponding fields, even if they are called differently in different standards, and save the modified info there. For example, if you change something in the field “CopyrightNotice”, this alteration will be saved in such fields as “Rights” (XMP), “CopyrightNotice” (IPTC), and “Copyright” (EXIF).